The Winter's Respite Read-a-Thon is over. I had a list of three books when I started. One for a specific date review (finished), one print and one ebook, both for fun and challenges. I may not have purchased The Deacon but it sounded good and was a free download. The other, A Cookie Before Dying is book two of a series. I thoroughly enjoyed book one and was looking forward to book two. Great Short Poems, jumped around...Purple cow anyone? Thanks Michelle, that was fun. I hope to do it again next year, and remember the mini-challenges! It feels like it's been a blah week, maybe only because of the weekend but other than a couple of dinners out I don't think anything happening here. Did participate in the Winter's Respite Read-a-Thon and that was fun. Lots of update posts. 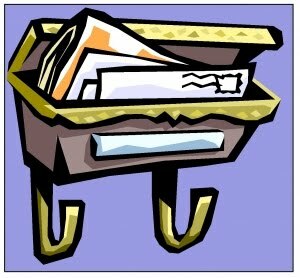 Need to blog Blogged about The Month of Letters, which is silly, I'll be away from the internet and snail mail for a week during the month! I'm still excited about it. A big thank you to Jenny Q at Let Them Read Books for hosting in December. 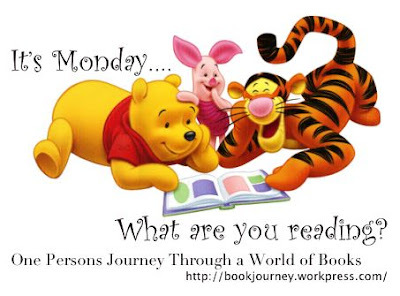 January's host is Alyce at At Home with Books(blog link, not post link). book of 150+ "Great Short Poems"
All you are committing to is to mail 24 items. Why 24? There are four Sundays and one US holiday. In fact, you might send more than 24 items. You might develop a correspondence that extends beyond the month. You might enjoy going to the mail box again. Snail mail! I found this on Cindy's Love of Books. I'll be away from the post office for a week during February but I still think this is fabulous! I have a couple of aunts and a SIL plus some out of town friends that deserve a letter. Send me your address (bookdragonslair at gmail dot com) if you want a post card! 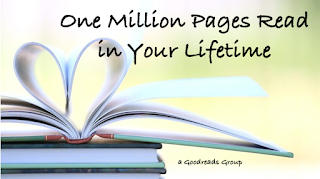 Someone noticed on Shelfari that a member had a goal to read one million pages during their lifetime and brought it over to Goodreads so they (and we!) could keep track of our reading. Since I'm on my blog a lot more than I'm on Goodreads, I'm posing about it. 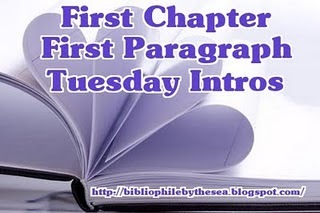 I started blogging in January 2009 and it would be nice if I could go back and add page count to titles. 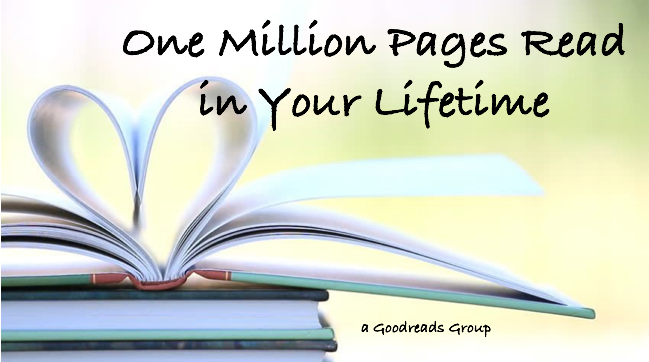 My husband things that if I went all the way back to elementary school, I'd already have read the one million pages! 2010: 7 titles - burned out in January? edited 9-3-13: Totally forgot about this one! I've keeping track of most titles for 2013. Once because it's funny as all get out and a second time because there is a grain of truth in each chapter. I had to double check that this is really a novel! This is politics taken to the absurd level and told from a comedians point to view. You'll laugh at Joe Homeland, he "operates a modest security firm", and his alert about what is really interfering with aircraft navigation and communications equipment. Then you'll cringe when the warning is taken seriously enough for there to be Senate Hearings on the subject. I'd really love to tell you all the funny jokes and bad puns but I just can't, read this excerpt and you'll see why. There are 54 chapters in this novel and most are around five pages. Just enough to get you to laugh...then hopefully you'll think about it. I don't know if that was the author's intention but this is a timely novel to be reading leading up to elections in the United States. I'm only at chapter 32 as I write this because I'm having a hard time reading it straight through. I'll read several chapters, think a bit before escaping into real-life or a different book, then come back. .....off to read some more! Currently at chapter 48 and I really wish there wasn't so much truth in this novel. Non-Americans are going to think Americans are idiots. Maybe we are. as for age...I'd say 14+, use your own judgement, this is a political book but I say if they're interested, let them read it. What's causing the country and now the President to lose their crackers and voters to elect Nitt Witts? Clowns and Turkeys are running Congress and the Nitt Witts are everywhere. But will one more Clown in Congress make any difference? Would the country be better off with some real Turkeys instead of those Clowns? Or are the Nitt Witts destined to run Washington? Set on historic Nitt Witt Ridge in Cambria, California and Capitol Hill in Washington D.C., Sebastian Gibson's satire paints the absurdities of the political world and of daily life with his unique sense of humor. The top political parties have degenerated into the Nitt Witts, the Turkeys and the Clown Party and the country is becoming deranged. Unless Mark Twain (Mark, a political consultant and his dog, Twain) can determine what's making people so neurotic and make sense of the madness, riots may cause the country's collapse. The Clowns are running for office with the slogan, "One more Clown in Congress probably won't make any difference." The Turkey candidates are running against the Clowns with their counter slogan, "Isn't it time we had some real Turkeys in office instead of those Clowns?" 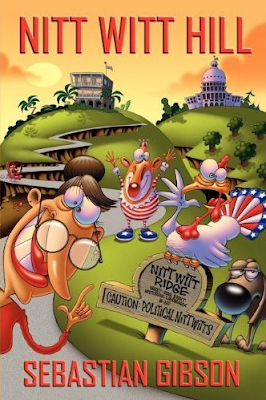 But it's the Nitt Witt Party who may have the most appeal to voters with their slogan, "Elect a Nitt Witt and see what some real Nitt Witts can do in Washington." Meanwhile, believing a lightweight metal alloy in bras when placed in contact with the wearer's skin is causing electrostatic interference with aircraft navigation equipment and with people themselves, Homeland Security and the Senate take action to prohibit the wearing of bras on airplanes and their sale in America. Still, the situation fails to improve and the country is on the verge of losing its collective mind. With the rhetoric of political parties at a level never seen before ("Turkeys are made for stuffing, Clowns are for Congress") and as protesters riot over the right to wear or go without bras and try to take control of the White House it's up to Mark and his dog Twain to determine the cause of the country's mental imbalance and find a way to save the country. Read the novel that's making Washington laugh so hard, Congress can't accomplish anything. It all begins and ends on Nitt Witt Hill. Check out my review for Lifting the Wheel of Karma, there's a giveaway! Tweeting my senator about PIPA. Entering to win a DreamHome at HGTV. Saw Mission Impossible: Ghost Protocol (loved it). Any book that you have personally purchased, been gifted, or swapped, BEFORE January 1, 2012 and just have not gotten the chance to read yet. NO ARCs, library books, re-reads or books purchased in 2012. Oh, don't forget to check out my review for Lifting the Wheel of Karma, there's a giveaway! One key piece of information was left off the back description and I don't know if it's supposed to be some big surprise or not. That's why the ~spoiler alert~! I started reading in the car but had to stop due to tears ruining my make-up! This book is so much more than I though it would be. A boy, dealing with nightmares, traveling to India for help. What I found was a boy, a loving family, vicious nightmares and a tragic accident. That accident is the spoiler for you as Joseph does travel to India but he does it in a wheelchair. Lifting the Wheel of Karma is not the usual type of book I read. It's one of the things I love about reviewing, the chance to go outside my comfort zone. I expected a quick read, easily read, easily forgotten when I moved on. What I'm finding is that I'm not ready to read the next book. I want to process what I've read first. I feel desire for the same peace Joseph was searching for. I wonder if it is possible to combine the Eastern philosophy he uses with my own Christian beliefs. There is strength in this book but I also wondered if it could have been shorter. As I was reading, I thought it was too flowery but Paul paints with words and I don't know how he could have left a "color" out of his painting. I do not know if I could have done as Billy and his parents had done. Joseph's parents kissed him good-bye, not knowing when they'd see him again. Billy dropped him off with a stranger, in a country far away, and walked away not knowing if he'd ever see his beloved brother again. So, the book is fiction but it reads like truth and there are lessons to be learned. Will you see them? Will you see different ones than I did? The author's website has pictures of India and Montana as well as the same discussion questions that are in the book. If Joseph is ever to find the peace he so desperately seeks, he must get this wise old man to reveal what he truly knows, but that will not be easy....for this sage knows far more than he admits. Now for the exciting part. Paul will give away 3 copies to my followers! Isn't that great? Just comment with your email. Closing date: January 30 (midnight PST). The winner will need to respond to my email quickly. Would you believe I stressed about "the first book of the year" and then finished one without realizing it was "the first book"? silly girl. The really funny thing is that my listing of books read for 2011 shows "A Christmas Clock" as the first book of the year, "Christmas Haven" is the first book for 2012! Went to Walmart....why yes, several books did jump into my cart ;) I also went to Barnes & Noble and it will be difficult for me not to start any of these before Feb 1....when my TBR Double Dare challenge ends. Hope everyone has a great week planned. I'm off to see if the gym remembers me. Thanks Bev! She wasn't going to host this one again but some asked and ... here it is! Join us again this year! Nine books. Nine colors. Well, seven specific colors plus one other and a word that implies color, such as rainbow or plaid. Struggled with brown last year but I had four review books to help with the list last year, not sure what I'll be reading this year! I've got two review books off the top of my head that will help...wonder if there are others. 1-6: Yea! Two titles chosen....seven more to go....I've got some ideas but wanted to get the initial post up so I could sign up. The main rule is that all books must be Pern related (duh!). There are several levels and you can move up but not down. Crossovers okay and any format is acceptable but the books must be read/listened to during 2012. See sign-up page for information. and if you're not familiar with Pern, challenge levels match dragon colors! Heart pounding in her chest, she crossed Sunset, eyeing the ferry terminal ahead. Take your current read, or book you previously finished, and tell me the following 3 things about it. this story takes place in Washington state. I really hope they're not drugging the cats! I had a dog I could dress up but never a cat that would sit still for it. 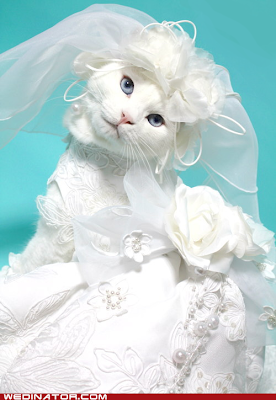 I'm trying to decide what the theme of the wedding would be that requires "an agent" to be ring-bearer. I'd really love to see a picture of the whole wedding party! 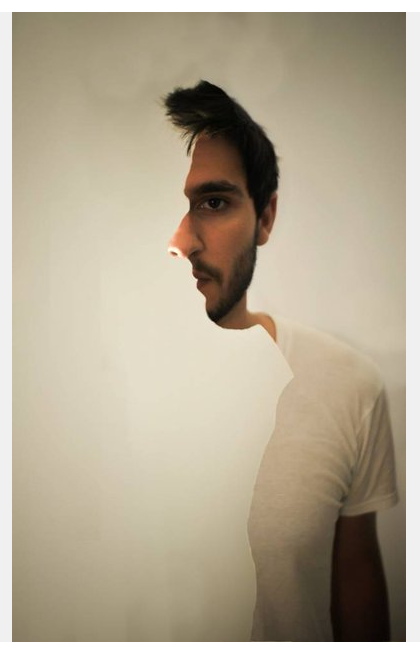 Which man do you see? It's very easy for me to see both now and I have to concentrate to see one or the other! 52in52, 150+, AtoZ, ebook, Mt. 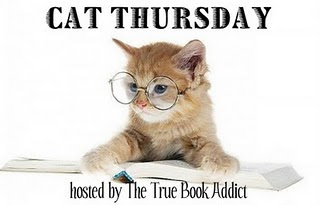 TBR, TBR Double Dare, Read Your Own Books, Off the Shelf, Free Reads, Why Boy the Cow?, What's in a Name? 150+, MMM, TBR Double Dare, Read Your Own Books, Off the Shelves, Mt. 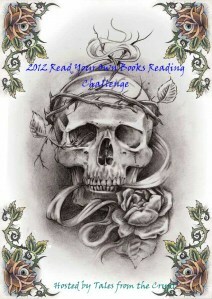 TBR, 50 States, Where are you Reading? ebook (2), A to Z, What's in a name? Just so you know, I have a weakness for Christmas books and so far I've never been disappointed with a Christmas book from Harlequin. Pay attention to the publisher of this one. This is from Harlequin's Love Inspired imprint so if scripture references or prayer disturbs you, this is not the book for you. I didn't find them to be a distraction (sometimes I do) and most of the prayers were internal. They were a small part of the story, just enough to give you the feel of the characters' character :) without being over the top. The suspense kept me engaged until it became edge-of-your-seat, the romance was gentle. Julie and Morgan were high school sweethearts until she left their sleepy town ten years ago. No big gush of I-love-yous or mushy scenes. Most of the time Morgan is trying to out-stubborn Julie to keep her safe. The first kiss was on page 102! There were a couple of coincidences, such as Julie's old boyfriend still being single, a police officer sheriff in her home town, and gosh darn, he just happens to be on the same ferry as her headed home after being in the city. To tell the truth, they happened so smoothly it wasn't until later that I went, 'hey'. Grade: B....loved it, share with friends and hope you get it back. Shock is police captain Morgan Wright's first reaction to seeing his former sweetheart, Julie Burns. But concern soon follows. The lovely social worker left Port Whisper behind years ago. Why is she back...and what's got her so scared? Lifting the Wheel of Karma . . . . The harrowing landscape was a disorienting mix of darkness and hypnotic light that appeared to ignore the rules governing its path, causing the eye to question what it saw. Joseph, aged seventeen, ran through lush vegetation in the entangled forest as he wielded a sword in his left hand. The sword was of a thin steel with a curve that extended from the handle to the tip. Carved into the sides of the steel were ornate designs of unknown origin. The handle was made of ivory and was capped with a slightly oversized gold tip to make sure the pinky finger was held in place when in use--which it surely was to be now. "There are more important things than walking, you know?" Madhu said. "Like kissing," Madhu replied while smiling at him. oh my gosh, it's 2012! What happened to 2011? I started my new year as I ended it, FarmVille, hardly noticed when the day ticked over. lol School is starting tomorrow so back to work for me. Super excited about the challenges I joined and sad about some I just couldn't. 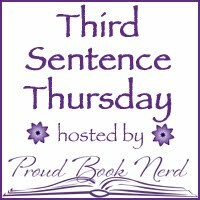 There are still a couple I'm thinking about and a new one found on Novel Challenges that I have to join, Anne McCaffrey's Pern series. Time to get back into the swing of things, reading, blogging, crochet, gym, cooking, cleaning, .... Hope everyone has a great week planned.